Mass production of carbon nanotubes (CNTs) and their applications in nanomedicine lead to the increased exposure risk of nanomaterials to human beings. Although reports on toxicity of nanomaterials are rapidly growing, there is still a lack of knowledge on the potential toxicity of such materials to immune systems. This article reviews some existing studies assessing carbon nanotubes’ toxicity to immune system and provides the potential mechanistic explanation. Carbon nanotubes (CNTs) are cylindrical molecules with a length of up to micrometers and a diameter of 0.4–2 nm for single-walled carbon nanotubes (SWNTs) and 2–100 nm for coaxial multi-walled carbon nanotubes (MWNTs). CNTs have long been speculated and tested as new materials for biological and biomedical applications. Because of their abilities to bind cells and across the cell membrane [1, 2], functionalized CNTs can be used as nanovectors for drug delivery and cancer phototherapy . On the other hand, when injected intravenously, CNTs will interact directly with immune cells and proteins in blood and tissues. Immunotoxicity is one of the consequences of using nanoparticles. Immunity is the function of the body to recognize and eliminate pathogens and foreign particles. The immune system is a tightly regulated network of organs, cells, and molecules. This system functions through cell-to-cell contacts and communicates via soluble mediators such as cytokines , which play a key role in immune defense, immunological homeostasis, and immune surveillance. Potential hazards from carbon nanotube production are associated with CNT inhalation and epidermal exposure. SWNT was shown to cause lung inflammation, granuloma formation [5–20], and mortality by intratracheal instillment into mice at a dose of 0.1 or 0.5 mg per mice . Mortality in this study was suggested to be caused by the toxicity of residual catalyst particles in the sample. However, mortality found in a rat study  was attributed to the blockage of the upper airways by the instillate and not inherently by SWNTs. In another report, SWNTs and MWNTs were intranasally instilled into BALB/C mice . Authors detected a general inflammatory response through air hyper-responsiveness and changes in macrophage cell count in interstitial spaces of the lung. It was also reported that intratracheally instilled MWNTs into the lung of rats  or pharyngeal aspiration of SWCNT into mice [9, 10] caused persistent inflammation and fibrosis, and eventually granulomas. A recent research showed that intratracheal instillation of 0.5 mg of SWMTs into male ICR mice induced alveolar macrophage activation , various chronic inflammatory responses, and severe pulmonary granuloma formation (Fig. 1). The uptake of SWNT into the macrophages is able to activate various transcription factors such as nuclear factor-NF-κB and activator protein 1 (AP-1). This led to oxidative stress, the release of proinflammatory cytokines, the recruitment of leukocytes, the induction of protective and antiapoptotic gene expression, and the activation of T cells. The resulting innate and adaptive immune responses might explain the chronic pulmonary inflammation and granuloma formation in vivo caused by SWNTs. Five different samples of MWNTs were intratracheally instilled into guinea pigs . Significant pulmonary toxicity was observed. Multiple lesions in all CNT-exposed animals were also observed. The authors concluded that, in conjunction with their previous report , the exposure time was critical for induction of lung pathological changes. The inhalation of MWNTs at particle concentrations ranging from 0.3 to 5 mg/m3 did not result in significant lung inflammation or tissue damage in C57BL/6 adult (10- to 12-week) male mice, but caused systemic immune function alterations . The potential mechanism of pulmonary toxicity of nanoparticles  is tentatively explained in Fig. 2. The initial acute inflammatory reaction is probably triggered by damage to pulmonary epithelial type I cells. The response includes a robust neutrophilic pneumonia followed by recruitment and activation of macrophages. The unusual feature of the response is a very early switch from the acute phase of the response to fibrogenic events resulting in significant pulmonary deposition of collagen and elastin. This is accompanied by a characteristic change in the production and release of proinflammatory (tumor necrosis factor-α, interleukin-1h) to anti-inflammatory profibrogenic cytokines (transforming growth factor-β, interleukin-10). The inflammatory and fibrogenic responses were accompanied by a detrimental decline in pulmonary function and enhanced susceptibility to infection. Other mechanistic explanations were also provided [10, 15]. One recent study presented that more dispersed SWNT structures altered pulmonary distribution and response . In this test, a dispersed preparation of SWNT with a mean length of 0.69 micron was given by pharyngeal aspiration to C57BL/6 mice. Macrophage phagocytosis of SWNT was rarely observed at any time point. No granulomatous lesions or epithelioid macrophages were detected. The results demonstrate that dispersed SWNT are rapidly incorporated into the alveolar interstitium and that they produce an increase in collagen deposition. 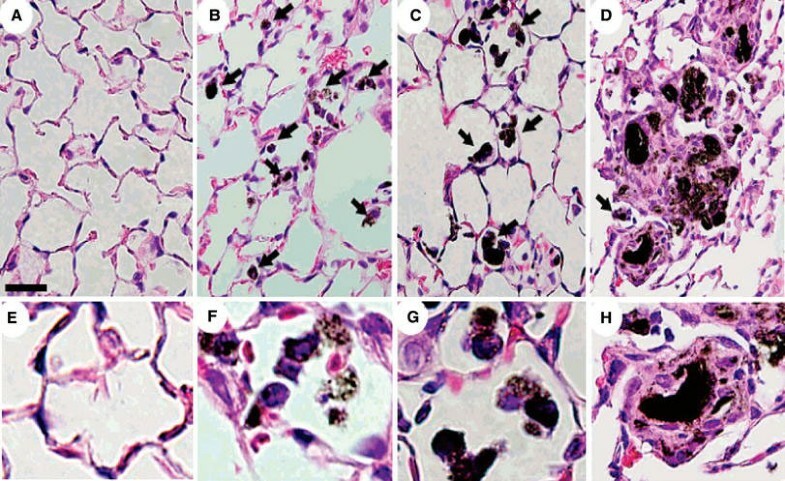 A new research showed that oxidative stress induced by SWNT in C57BL/6 mice and Vitamin E deficiency enhances pulmonary inflammatory response . Although there is evidence that it takes energy and agitation to release fine CNT particles into the air and the current handling procedures do not produce significant quantities of airborne CNT , an extreme caution is highly recommended. If CNTs penetrate the stratum corneum cells and become lodged into the viable epidermal cell layers of the skin, they may enter the keratinocytes directly or trigger the production of proinflammatory cytokines or initiate other sequela . Studies on skin irritation by CNTs are extremely limited at this time [16–19]. Skin irritation was evaluated by conducting two routine dermatological tests among volunteers. Their tests showed no irritation in comparison to a CNT-free soot control, and it was concluded that no special precautions have to be taken while handling these carbon nanostructures . In another experiment, CNTs were subcutaneously implanted into BALB/c mice and CD4+ and CD8+ T-cells in peripheral blood, and the histopathological changes on skin tissues were measured . SWNTs were shown to activate major histocompatibility complex (MHC) class I pathway of antigen–antibody response system resulting in the appearance of an edematous aspect after one week. After 2 weeks, high values in CD4+ and CD4+/CD8+ were detected indicating an activated MHC class II. No death or body weight changes were observed within 3 months . One recent study illustrated that the length of CNT modulates inflammation response. When 0.1 mg of CNTs were implanted in the subcutaneous tissue in the thoracic region in each rat , there were more inflammation around 825-CNTs (long) than that around 220-CNTs (short) since macrophages could envelop 220-CNTs more readily than 825-CNTs. However, no severe inflammatory response such as necrosis, degeneration, or neutrophil infiltration in vivo was observed for both CNTs examined throughout the experimental period. Potential clinical use of CNTs suggests that a wide range of biological systems must be evaluated. Some in vitro studies are summarized below. Mammalian cells have at least five ways to internalize macromolecules or nanoparticles: phagocytosis (via mannose receptor-, complement receptor-, Fcγ receptor-, and scavenger receptor-mediated pathways), macropinocytosis, clathrin-mediated endocytosis, caveolin mediated pathways, and clathrin/caveolin-independent endocytosis [28–30]. MWNTs were used to deliver amphotericin B (AmB) to Human Jurkat lymphoma T cell by linking AmB and fluorescein to CNTs . Maximum fluorescence was observed after just 1 h of incubation, indicating fast cell uptake of FITC-AmB-MWNTs. Most conjugates were found in the cytoplasm and around the nuclear membrane. Recently, carbon nanotubes have been shown to traverse cellular membranes by endocytosis and shuttle biological molecules, including DNA, siRNA, and proteins, into immortalized cancer cells [3, 16–19, 21, 32–35, 38]. Single-walled carbon nanotubes (SWNTs) may serve as nonviral molecular transporters for the delivery of siRNA into human T cells and primary cells. Another report presented that SWNT and SWNT-streptavidin conjugates can be taken up into human promyelocytic leukemia (HL60) cells and human T cells (Jurkat) . The uptake was also suggested to be through endocytosis [34, 39]. However, evidence was also presented that the cell uptake of CNTs was through nonendocytosis pathway based on the lack of temperature dependence and lack of inhibition from endocytosis-specific inhibitor [35, 40]. The oxidative stress is induced by exposing cells to CNTs. According to the hierarchical oxidative stress hypothesis, the lowest level of oxidative stress is associated with the induction of antioxidant and detoxification enzymes (Table 1) . The genes that encode the phase II enzymes are under the control of the transcription factor Nrf-2. Nrf-2 activates the promoters of phase II genes via an antioxidant response element . Defects or aberrancy of this protective response pathway may determine disease susceptibility during ambient particle exposure. At higher levels of oxidative stress, this protective response is overtaken by inflammation and cytotoxicity (Table 1). 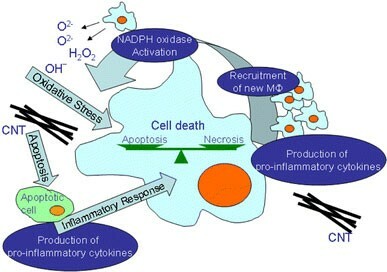 Inflammation is initiated through the activation of proinflammatory signaling cascades (e.g., mitogen-activated protein kinase and NF-κB cascades), whereas programmed cell death could result from mitochondrial perturbation and the release of proapoptotic factors. Using guinea pig alveolar macrophages, cytotoxicity was detected with SWNTs and MWNTs [16–19, 42]. High concentration of pristine and oxidized MWNTs have been shown to generate loss of viability of the human Jurkat T cells and human peripheral blood lymphocytes . A comparative study on the toxicity of pristine and oxidized MWNT in human Jurkat T leukemia cells has shown that the latter were more toxic . However, in a different report, highly purified SWNTs was taken up slowly by human macrophage cells with low toxicity . Similarly, CNTs were found across the cell membrane of rat macrophages (NR8383) , but no cytotoxicity was observed. Cherukuri et al. investigated the uptake of pristine SWNT into the mouse J774.1A macrophage-like cell line via near infrared fluorescence microscopy. The study reported that the macrophage-like cells appeared to phagocytose SWNT at a rate of approximately one SWNT per second, without any apparent cytotoxicity . The SWNT remained fluorescent, suggesting that the macrophage-like cells were not capable of breaking them down within the time period of study. This result is inconsistent with previous macrophage investigations [8, 42]. The biochemical cascade that removes pathogens, known as the complement system, consists of two pathways. The classical complement pathway is activated by antigen–antibody complexes, whereas the alternative pathway is antibody independent. Nanoliposomes and engineered carbon nanotubes can activate the complement system. Intriguingly, both SWNTs and double-walled carbon nanotubes (DWNTs) stimulated the classical pathway , but only DWNTs triggered the alternative pathway. The mechanism of this selective complement activation remains unknown. Interactions between chemically modified SWNTs and B and T lymphocytes as well as macrophages were studied at a concentration of 10–50 μg/mL . These functionalized SWNTs were taken up by cells without inducing toxicity. Authors found that only the less soluble ones preserved lymphocytes’ functionality while provoking secretion of proinflammatory cytokines by macrophages. Nitric oxide, TNF-α, and IL-8 are key inflammatory mediators when macrophages are activated. Interestingly, after CNTs were taken up by murine and rat macrophage cells, no inflammatory mediators such as NO, TNF-α, and IL-8 were observed [2, 44]. However, a dose- and time-dependent increase of intracellular reactive oxygen species and a decrease of the mitochondrial membrane potential occurred. Incubation with the purified CNTs had no effect. Inflammatory responses were also observed when human epidermal keratinocytes or human skin fibroblast was exposed to CNTs [24, 46–50]. The mechanism is likely due to the production of reactive oxygen species, leading to the activation of the NF-κB. Another research demonstrated that 30 nm CNTs penetrated skin tissue within 2–3 min during microimaging MRI experiments . Cell adhesion function was reported to be altered by nanotubes . Biotechnology-derived pharmaceuticals can cause specific antibody response (antigenicity). Antibodies are specialized proteins produced by plasma B cells in response to an antigen or foreign materials. The immune response to a composite nanoparticle-based drug potentially involves antibodies for both the particles and the surface groups. To date, there are very limited studies on the antigenicity of functionalized nanoparticles and none of them report CNT-specific antibody generation [16–19]. CNTs functionalized with a peptide antigen (B cell epitope from the foot-and-mouth disease virus, FMDV) was studied [53, 54]. The CNT-FMDV was recognized by antibodies equally well as the free peptide and the immunization of mice with the CNT-FMDV clearly enhanced anti-FMDV peptide antibody responses. Moreover, no immune response to CNTs was detected, which is an important issue in view of epitopic suppression when peptide antigen carriers are used. A variety of factors, such as particle surface properties and functional groups, may ultimately affect the systemic antigenicity of CNTs when it was used as drug carrier. Size, shape, structure, and surface all play a role in defining nanotoxicity. The aggregation status and π–π electronic effects may also be important in case of CNTs. CNTs have an unusually large surface area/mass ratio. The large surface area gives the particles a greater area to contact with the cellular membrane and proteins, as well as a greater capacity for absorption and transport of bioactive substances. The large surface area also suggests that chemistry modification may impact significantly the biological activities of CNTs [16–19]. Contamination is one of the reasons for CNTs’ potential harm. The presence of such impurities interferes with our study on the inherent toxicity of CNTs. Transition metals are particularly effective as catalysts of oxidative stress in cells, tissues, and biofluids. A report  compared the interactions of two types of SWNT (1) iron-rich (non-purified) SWCNT (26% of iron) and (2) iron-stripped (purified) SWNT (0.23 wt% of iron) with RAW264.7 macrophages. Each type of SWNT was able to generate intracellular production of superoxide radicals or nitric oxide in the cells. Less pure iron-rich SWNT were more effective in generating hydroxyl radicals, and superoxide radicals, accumulating lipid hydroperoxides, and causing significant loss of intracellular low molecular weight thiols (GSH). Therefore, the inflammatory responses caused by nanotubes with metals can be particularly damaging. Oxidative species generated during inflammatory response can interact with transition metals to trigger redox-cycling cascades with a remarkable oxidizing potential to deplete endogenous reserves of antioxidants and induce oxidative damage to macromolecules. Chemical modifications of nanoparticles surface holds promise to confer them improved biocompatibility. 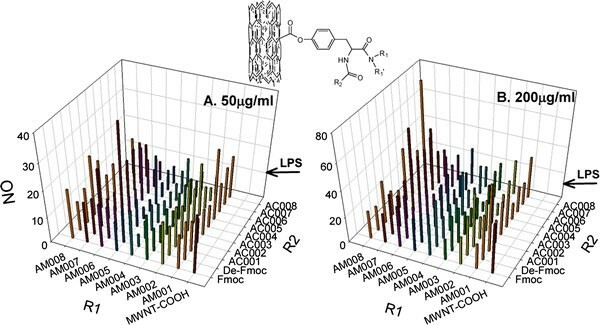 Nano-combinatorial chemistry approach was used to generate a MWNT library containing 80 different surface modifications . In addition to the successful regulation of protein binding and cytotoxicity, they also showed different activity in activating immune systems as measured by nitric oxide generation (Fig. 3). Compared with the precursor, MWNT-COOH, many modified MWNTs exhibited lower immune responses . More biocompatible and immune-friendly nanomedicine carriers can be developed through iterative screening and optimization studies. As nanotechnology-based products and nanomedicine research are relatively new, there are currently no standardized guidelines for assessing immunotoxicity generated by CNTs. Many important issues need to be addressed in order to develop a new generation of nanomedicines. Available data (Table 2) strongly suggest that CNTs enter cells, cause ROS, and interact with the immune systems. A better understanding of the mechanisms of CNTs’ interaction with immune systems is still needed for developing and optimizing biocompatible nanomedicine carriers. Yanmei Yu and Qiu Zhang contributed equally to this work. This work was supported by Shandong University, the American Lebanese Syrian Associated Charities (ALSAC), and St. Jude Children’s Research Hospital.